In this series we will look mainly at Google search engine, because it has the largest market piece. When we look something up in Google we get results back of the most relevant websites. But when we look at the results we have 3 different types of results. The first type of result is most times the ads or the sponsored websites. The picture above will show a sponsored website. These can be identified by the “ad” icon below the title. These are websites that people advertise with through Google Ad words. The second search results are the local search results. These search results are easily identified by the map and the review stars. 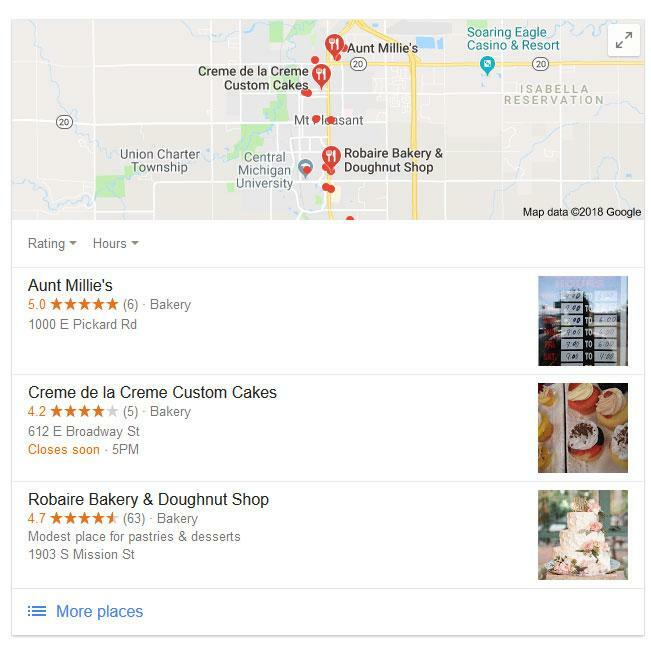 These results come from Google and if you have setup a Google My Business page, it will show here. The third search result is what’s called organic search results. These are the websites that are optimized for the search query that the person typed in the search bar. To show up high in these results, you need to have done some SEO on your website or you will show up if there is not much competition. Most times this is the hardest place to show up at. Google has more than 200 factors that play a role that decide how high you are going to be ranked. These factors will change over time and the main factors that have changed over the last couple of years we will describe below. Since everyone is using mobile devices, like cellphones and tablets its only normal that Google has been working on making that part of their ranking system. Right now 70% of the people are using their mobile device to look up information. If your website shows up in the results but is not mobile friendly people will leave your website again because it’s not easy for them to view your website. Next to that your website will pretty soon not even show up on mobile devices if it’s not mobile friendly. So this is an important part of your online presence. SSL or Secure Socket Layer is an encryption system for websites. It is easily recognized by the lock icon in front of the website address. SSL means that information will be send back and forth with encryption. This way when you are visiting a website no one can see your information. This is in our view a must if you have a web shop or any other online ecommerce feature on your website. Visitors will also trust the website more than a website without an SSL certificate. One of Google’s goals is safety online and has made it clear that they would like to see all websites use SSL certificates. How fast is your website loading? Since more and more people are using mobile devices to look up information, it is normal that the speed of a website loading has become more important. Most devices are not 100% of the time hooked up to a Wi-Fi connection and will be using 3G or 4G connections to load a website. The 3G and 4G connections are slower than Wi-Fi and if your website takes too long to load people will go look at a website that loads faster. If this happens then you lose visitors to your website and has a big impact on your online presence. To test your website we have 2 links here below. These links are setup by Google and will let you test your website’s speed and will tell you how to improve it. It will also show you an estimated visitor loss based on your speed.